Origin and Habitat: Gymnocalycium hamatum was discovered by Friedrich Ritter near Palos Blancos, Tarija, Bolivia in 1958. Up to now this species has only been found near its type habitat at Palos Blancos. Altitude range: 730-870 metres above seal level. Gymnocalycium delaetii subs. marsoneri (Y.Itô) H.Till & Amerh. Gymnocalycium tortuga R.Blossfeld ex Backeb. Gymnocalycium marsoneri subs. matoense cv. Multiproliferum hort. Gymnocalycium matoense f. prolifera hort. 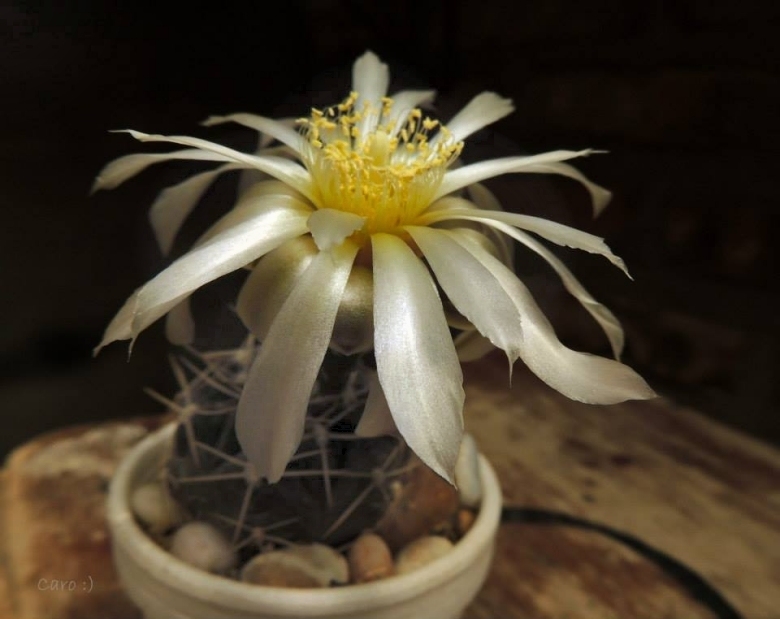 Description: Gymnocalycium hamatum (firstly described as by Friedrich Ritter in in "Kakteen in Südamerika" vol 2, 663-664, 1980) is a local or morphological form of Gymnocalycium marsoneri. It has an olive green, tuberculate body. The pale coloured spines are all radial, standing out from the body, straight but slightly hooked at the tip. However the distinguishing characteristics of Gymnocalycium hamatum, appear to fall within the natural variation of Gymnocalycium marsoneri and it should be synonymized with the latter. Note: Gymnocalycium hamatum has been made synonymous to Gymnocalycium marsoneri subs. megatae by G. Charles without specifically justify that choice. Stem: Usually solitary (not clustering), globular flattened, 6-18 cm in diameter grey-green, olive green to coppery brown. Ribs: 9-16 with blunt tubercles. Areoles: 5-8 mm long, 3 mm wide, 10-18 mm apart, with a cream to white wool. Spines: All radial, 5 to 9, 15-20 (or more) mm long mostly creamy-white or light yellowish brown, some-times reddish-brown, stiff, straight but slightly hooked at the tip, hence the specific name (Latin adjective “hamatus”, “hamata”, “hamatum” = hooked). Fruits Red, with a blue bloom, fusiform, 25-30 mm long , 15-20 mm wide. Pulp pinkish. 1) Terry Smale, Cactus and Succulent Society of Great Britain “Notes on the 1977 seed distribution” Cactus and Succulent Journal of Great Britain”, Volumes 39-43 page 17, 1977. 2) Gymnocalycium hamatum F. Ritter <http://www.richtstatt.de> Web. 9 May. 2015. 3) Demaio, P. H., M. H. J. Barfuss, W. Till & J. O. Chiapella. 2010. “Phylogenetic relationships and infrageneric classification of the genus Gymnocalycium: insights from molecular data. Gymnocalycium” 2010: 925–946. 4) Navarro Sánchez, G. 1996. “Catálago ecológico preliminar de las cactáceas de Bolivia.” Lazaroa 17: 33–84. 5) Jørgensen, P. M., M. H. Nee & S. G. Beck. (eds.) 2014. “Cat. Pl. Vasc. Bolivia”, Monogr. Syst. Bot. Missouri Bot. Gard. 127(1–2): i–viii, 1–1744. Missouri Botanical Garden Press, St. Louis. Cultivation and Propagation: Gymnocalycium hamatum is a summer grower species that is easy to cultivate.